The CP System III (CPシステムIII shīpī shisutemu surī?) or CPS3 is an arcade system board that was first used by Capcom in 1996 with the arcade game Red Earth. It was the second successor to the CP System arcade hardware, following the CP System II. It consists of one PCB with flash-SIMMs and a CD-ROM drive, with the games using a special cartridge and a CD. It is a JAMMA system with a JAMMA+ harness and stereo RCA connectors for use with an external amplifier. CPS3 games come on CD whose contents are slightly modified and copied to the flash-SIMMS placed on the board. The process of installing a game to the board takes between 25 and 45 minutes. The cartridge is an essential part of the setup, since it contains a CPU and also the decryption keys for the game. It it usually setup with a black metal bar that keeps the cartridge in place. 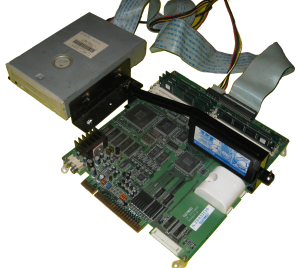 There is also a metal cover for the CPS3 motherboard, but it seems only the earliest games were packed with that setup. Very recently (September 2012), there has been significant progress towards restoring suicided CPS3 boards. Please see this thread for more information. There are three kinds of flash-SIMMS for CPS3: 32MBit, 64MBit and 128MBit. The 32MBit one has two surface mount chips on it, the 64MBit one has 4 and the 128MBit one has 8. Sometimes the SIMMS have stickers with names such as PRG (64MBit), SND (32MBit) and CHR (128MBit), though it is best to identify them by the number of chips on the SIMM. Each game has different storage requirements, so a board suited for one game might need more memory to run other game. However if the board is set for the larger games, it will run without using the extra memory without problems. Street Fighter III: 2nd Impact has a Widescreen mode (first option on the game settings menu). It works on a 16:9 arcade monitor. The JAMMA+ harness found in CPS-3 is 32 pins in two rows. It is most commonly used as a Kick Harness, extending the JAMMA 3 buttons per player to 6 buttons, and is used by all the games in this platform. The pinout can be found in the Kick Harness article. The volume up and down buttons in the harness have the same effect as the ones in the board. The harness is compatible with the Sega Naomi I/O board by Capcom and CPS2 games. The game specific cartridge has a CPU and the decryption keys held in a custom ASIC. If the battery dies or the CPU detects tampering, the keys are erased. The tampering includes variations in voltage, static electricity, pulling the cart out while the game is running or even touching the bottom part of the board while turned on. There are even rumors that connecting the kick harness while running might cause this as well, but this is unconfirmed. The battery can be changed to prevent it from committing suicide, and this should be done once every 5 years or whichever is the expected life of the battery used. Please check the external links page for information on how to change the battery. Nothing can be done by the community regarding suicide cartridges. Capcom of Japan is rumored to still service them through local retailers, but this is unconfirmed . Sometimes a hum is present when using the RCA stereo out, in case of a SuperGUN a ground loop isolator solves the problem. When using a QSound amplifier, a 18v transformer is needed since Capcom cabinets fed them with only 12volts. So far we've documented three revisions of the CPS3 board by Capcom. The main difference between them is the section of the board that is covered by a white plastic case, which is closed by the same kind of screw CPS-III security carts use. Here are pictures of each type of motherboard and a close up of the section that differs. Note that a model 1 has yet to be documented. So far this kind of motherboard has been found on its own and inside the metal casing issued by Capcom to protect the boards on early models. It is unknown is a 95682A-1 revision exists and was released to the public. The only section that differs is under the plastic cover as mentioned earlier, here is a close up of that area. As it can be appreciated, it has been equipped to hold a 256K SRAM 70LLSOP and a battery, but they were deployed without them. Around the plastic cover there are some differences as well, mainly CN2, CN3 and CN4 which have no pins. CN1 is the kick harness, CN2 is 4 pin, CN3 is 8 pin and CN4 is 10 pin. This could be used for in game input or service purposes, but were removed in later revisions. Also several points were removed from the layout, probably jumpers labeled EXC7 to EXC18, three pins each. Of all the components and PCB layout only 13E NM93C46A survived to this revision, all CN2 to 4 and EXC7 to 18 were removed, as well as the battery entry points and the SRAM layout on the PCB. The plastic case cover was kept and is closed on all our boards. This is virtually identical to revision 3, no differences have been spotted so far. However serial number in the pictured board is lower than on the revision 3 above. The black metal bar is just the security card holder. This page was last edited on 26 March 2013, at 23:07.